You love cats? – so have some more! For many years people saw me as a cat-lover. I had many cats, up to 16 sometimes and so they thought I wouldn’t mind having some more to care for. One day, a distant friend of mine brought me 3 kittens which she had found in Rome, left alone in the streets. It was intended as a gift, but huh!!!! Three more cats to sterilise and feed! We agreed that I took two and she would pay for the neutering of one of them and take home the third. 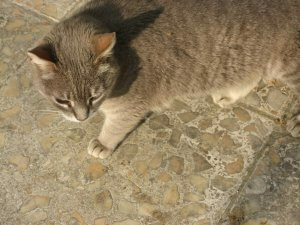 Thus two grey cats stayed with me. One I could give away and the other was – Usbeka. What a strange name, you might think. But in this period I had 3 Usbek men living in my place and helping with the reconstruction of my house – hence the name. Usbeka was a gentle but very self centered cat. She kept her distance from the others, especially from Queen SnowWhite who ruled over the whole tribe and who just had born 4 kittens, white like herself and sweet. She didn’t want any other cat around, even less newcomers, and so Usbeka’s behavior was unremarkable until she gave birth to 2 grey kittens. Now the power of a mother arose and for a short time she went into competition with ShnowWhite who wasn’t an active mother at that time. Fortunately I found another home for the 2 grey kittens and afterwards, not being mother anymore, Usbeka fell back into her underdog existence. She began to stay away for days and finally didn’t appear any more. 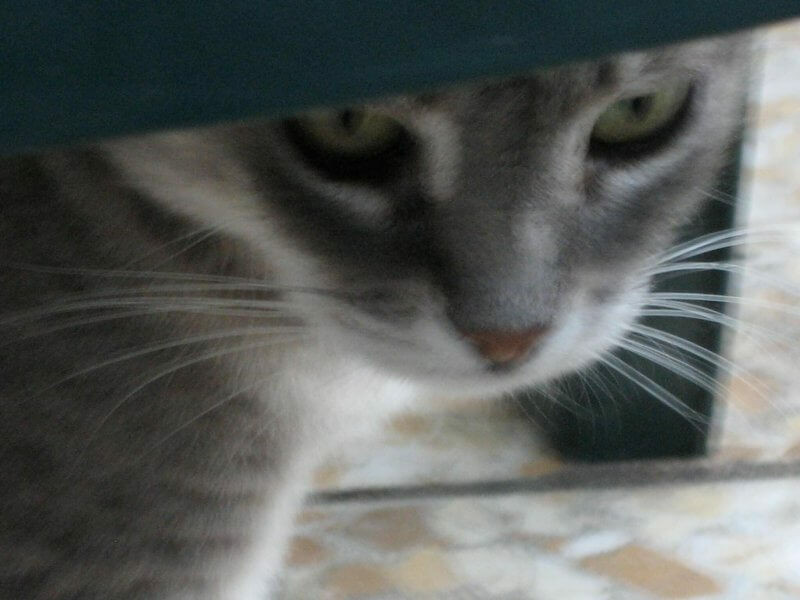 After a year or so the neighbor beneath my grounds talked about a grey cat whom he had been feeding for a long time, and yes, it was Usbeka whom I had believed dead in the meantime. I was glad to know that she was alive, but she didn’t seem intent to come back “home” again. In those times I had a very sweet dog, Max, who was keen in taking care for HIS animals and in chasing away all those which he considered strangers. Because of the long absence of Usbeka she was considered as “non belonging” by Max and this didn’t help her returning home again. Thus, instead of feeding the animals near the house and openly, I constructed a big cage-like section at some distance from the house with a small hole, just for cats, but not for dogs. This helped in 2 ways: the dog wouldn’t eat the cat food and the cats could eat undisturbed by bigger intruders. I began to notice that, every now and then, Usbeka jumped out of this fenced area and ran away at high speed, the dog following her to the neighbor’s ground. I understood that Usbeka was ready to “come home”, but that it was a question of fear of being attacked by Max. When you live in the countryside with a lot of plants and animals you cannot avoid becoming creative in resolving the many problems which, before, you had never thought would exist. So I figured out that Usbeka would come to eat when the dog was safely distant. After distributing the food I chained the dog about 100m away from the cat place. Max didn’t like that and barked all the time while he was bound. That gave the signal to Usbeka that the dog wouldn’t be able to chase after her – and regularly we saw her run to the feeding place, gobble down her food and shoot away again. This went on for many years. Usbeka held the absolutely lowest rank in the cat tribe which was first dominated by SnowWhite and, after her death, by her granddaughter Schnurri (she deserves an extra post! Watch out for it). Then also Schnurri died for the disease of white cats who are exposed to strong sunlight, and the role of the Queen was vacant again. Believe it or not: in no time flat Usbeka climbed the throne and from the outcast she developed into an absolute tyrant. Who would have thought that! The fear was gone, the dog had already accepted her as part of the family, but now he was required to follow her will. She made very clear who was the boss from now on and who made the rules. In case of disobedience she distributed hisses, paw slaps or even assaults to let the others know what their rank was. She proudly ate first, alone at her bowl, with much ease and not hurried at all. She seemed to enjoy her newly earned status. This went on for many years. 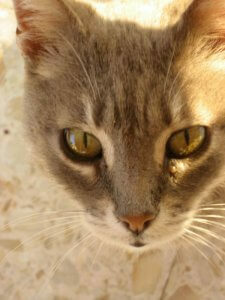 Usbeka was a grey cat, but slowly I thought: “she is getting grey”, as people get grey hair when they age. She calmed a little down – though not as much as to lose her supremacy. The atmosphere in the cat tribe softened a little as she entered into her 17th year. That was really fine with me because also for us humans it is quite tiresome when there is distress among the animals – although also amusing from time to time. When Usbeka reached her 18th year a big hump appeared on the right side of her belly. Slowly it grew and I began to be preoccupied and took her to the vet. Well, it was a cancer and not really much could be done about it. In time I realized that she had pain and I began to give her pain killer shots every day which, for some hours, brought her back to her dominant attitude, at least a little, but the cancer was creeping up and pushed her into an ever more subdued state. Then, one day, the lump exploded and released liquid which couldn’t be stopped any more after that. Flies threatened to make things worse – I once had an unpleasant long experience with flies having deposited their eggs in sheep’s ears… And so I decided that it was better for Usbeka to be put down. Usbeka was buried near her rivals, especially SnowWhite and her 3 snow-white offsprings. She has enriched my life with many insights about how animals “think” and behave. I also realised, by living with all those animals, how little we humans are different from them. How often do we act and react in similar ways! What I believed to be “human culture” at least partly I recognized as biological conditioning which we humans share with animals. A humbling and equally exciting recognition which helps me to understand many things which humans do and which seem to be totally inappropriate and without reason. Yes, we humans use reason much less than we love to pretend, but more often than not we are directed by emotions, instincts and intuitions which we share with the world of mammals. So if you want to learn about humans get in intense contact with animals – and you will see what life is about! Nice story Heidi thank you! Hi Ella and thanks! Waiting for an update story from you! Hello Heidi, Usbeka, what a creative name! Ha ha so she was named after those Usbek workers! And what a journey for her! I am amazed at how she changed over the years, from an underdog, I mean undercat, to bring homeless and to become a queen of the tribe! I wonder how many cats you have now? I have only 5 cats now and I am running out of stories. Every day life with them seems unremarkable, but if I really think about it: there might be some noteworthy moments to talk about, too.